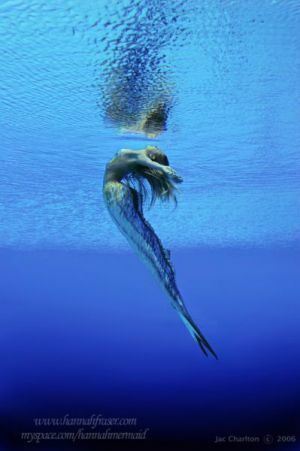 Mermaids that make a real-life splash! That’s what Hannah Fraser answers when you ask her what she is. The Australian native can dive up to 50 feet into the ocean on one single breath–allowing her to engage with underwater wild-life most of us will never know. “I have found a way to integrate with their environment and swim with them, and have a level of comfortability that most people will never experience in their life” Fraser tells Abc’s “20/20”. No mask, no oxygen. Fraser swims with the grace of a dolphin by using a man-made tail. As amazing as Hannah Fraser is–she is not alone. Linden Wolbert was captivated by life in the sea at a very young age. Like Fraser, Wolbert swims with a tail. Only her’s was created by Allan Holt–a Hollywood special effects artist. Wolbert’s call to fame is her great ability to hold her breath. She can dive underwater for up to five minutes without coming up for air. She attributes this amazing skill to being able to “tolerate the discomfort” your diaphragm feels when your body needs to breathe. At the Vertical Blue free-diving championships, Wolbert set her personal best by diving an astounding 91 feet deep and back up on one single breath. But it’s not just fun and games for Wolbert. She wanted to give back, so she is dedicating her time to an organization called Swim to Empower. Her focus is on Bahamian children. “More than half the people in the Bahamas don’t know how to swim, and 100 percent of them are surrounded by water,” said Wolbert. The goal of the organization is to have every single Bahamian who wants to swim be able to.